The BoBunny Blog: KRAFT! DOUBLE DOT! STAMPS! Ok guys, it's our final new product day, and we are so excited to show you our new line of KRAFT goodies! There are all sorts of kraft items to mix and match with all your crafting! Plus we have new Double Dots and stamps! Decorative paper roll to wrap, mod podge, or tear any way you'd like! And finally some Kraft Gift Bags that come in 2 sizes plus a sheet of stickers to use as closures. And finally...NEW DOUBLE DOT! I know you've been anxiously awaiting new colors! We have 3 new colors and 3 new VINTAGE dots! I can't even tell you how much I love the new double dots!! And the Kraft! Love it all! What are your thoughts? Leave us a comment for a chance to win! We'll announce all winners tomorrow! Good Luck! kraft is so versatile! Love the new stamps and dd cardstock! Oh boy... better set aside some money for this! Love it! 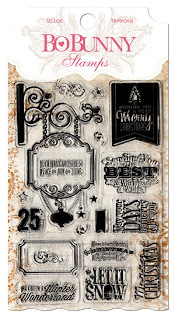 I love the grungy style stamp set....absolutely fabulous!!! I loooooove the double dots! I can't get over how inspired I am after seeing all the new items. So creative and unique. 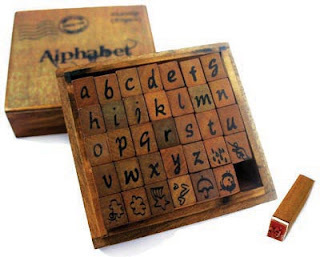 Love the wood pieces and stamps. Too much gorgeous stock!!! My wallet is crying!!! Love the double dot colours...the pleated burlap and the wood shapes!! 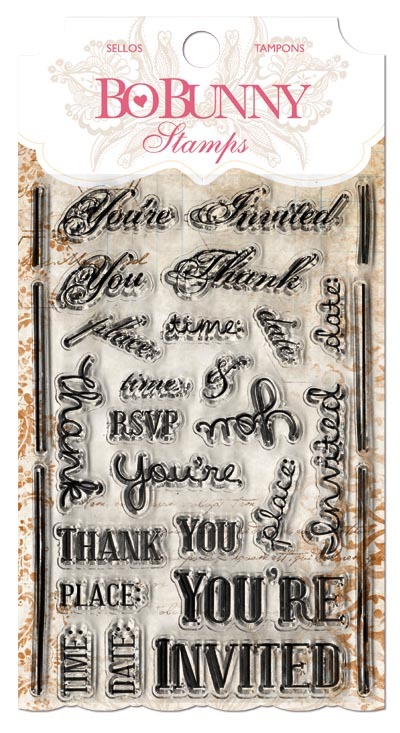 Love the wooden embelishments and the stamps! the bags are cute too! Очень люблю горошек на бумаге ! Надеюсь и верю в удачу !!! Hugs!. Thanks for the chance! Oh my! I love these Kraft products!! I also love the new double dot papers! I love the kraft bags..this is a must get on my list! What a super fun collection. 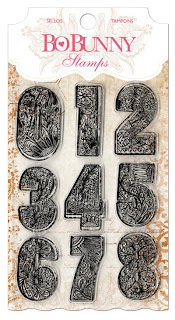 I love all the stamps, the fun wood pieces the beautiful burlap ribbon and the cute double dot card stock. This collection ROCKS! Loved the paper strips and paperbags! Love all the krafty goodness, especially the wood embellishments! However, I can never seem to have enough Double Dot papers and I absolutely love the gorgeous new charcoal and jade colors! I adore Kraft anything...so this line is way up on my wish list! Great! Lots of yumminess! 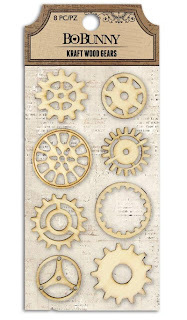 Love the clear stamps, the DD paper, and the wood clocks and gears! What a great new bunch of staples, these will go with any and everything, so exciting! You had me at the ruffled burlap ribbon...that will make some serious dimensional flowers. I really want those number stamps also. Your kraft goodies will certainly see their way into my stash. Looove the collection... the bags would be great for a mini album and the burlap would be a great accent. Love the kraft, so man ideas with these! amazing!!! Love the vintage feeling!! Yay! Kraft is back & it comes in baggies! And how awesome is that double-dot? I love the grey & the rich yellow. These are so cool! I am in love with the wood pieces and the double dot colors are so cute! 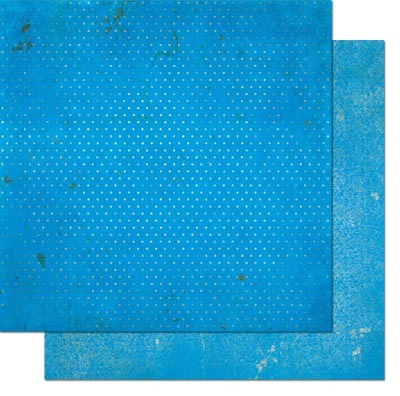 Love the kraft papers and I'm just a sucker for the blue shade on the Brilliant Blue Vintage paper... not to mention I love Double Dots papers!! Wow! I can't believe how much I'm loving all the new things! The Kraft collection is just so perfect for anything and the double dots are a sure winner in my eyes! ooooh, I absolutely love everything in this post... you've really hit the spot with this collection! what a fun masculine line! So much goodness!! Love it!! What a grand finale! I am totally loving the kraft!!! Even more super exciting is the oversized papers and the new double dot!!! Wheeeee!!!! Just wonderful! Can hardly wait! Love all the kraft goodies!! Well, I know I will go broke... but I will be happy! These are amazing! The bags, the stamps, the paper strips... too cool for words! The Kraft goodies are utterly fabulous! Love the paper sheets for mixed media! I love the wooden embellishments - they are all amazing! More amazing products! I'm envisioning some fabulous smash pages with those baggies! And I love all the new stamps! So excited about the new double dots colors and the kraft acessries. Everything today is a hit with me. Hoping I win nd beat my friends since I am in love with this. Thanks for coming up with the new products. Love that burlap ribbon and the double dot - OMG. I love the new colors. Can't wait to get some of the double dot papers to add to my collection of them. WTG BoBunny. Can't wait to get a hold of these! Love, Love, Love them! 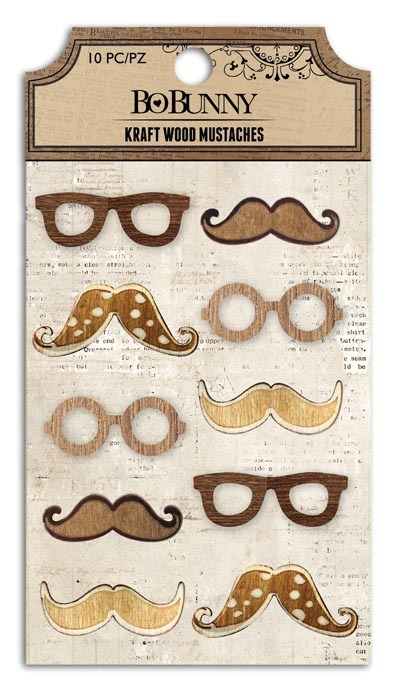 Love the new wood embellishments, especially the glasses and mustache !! Absolutely fabulous!!! love the Double dots! AWESOME!! Love it!!! Love the burlap and the dots cardstock!!!! The possibilities are endless!! I love the burlap. Very cute! Thanks for a chance to win. Love all the kraft, but the stamps are fabulous!! Oh I am dying here there so much I want from your new releases! Well actually I want it all! Awesome job! Can't wait till it gets to my store! wow these are fabulous!! love them! Wow Bo Bunny, what great additions! I see great possiblities :). LOVE the stamps and the new double dot papers!! Oh, wow - all the kraft goodness, and the embellies, and pleats, and the beautiful double dots - love it all! Judy D.
I am adoring that pleated ribbon, the paper sacks and well pretty much everything!! I love that you have a kraft line! Amazing! Fantastic! Love, love the kraft products!! 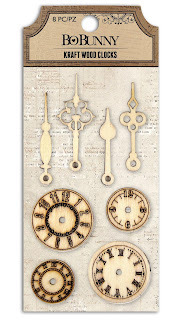 These Wood embellishments look really interesting! Love the double dots, too! OMG!!!! Now most of this is coming to my home!!! I just love burlap and craft colors!!!! Beautiful! oh gawd! LOVELOVELOVELOVE all of these kraft elements!!! whoohoo! 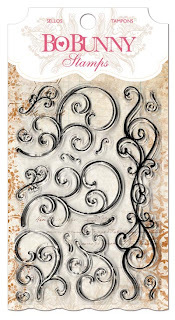 My fave is the flourishes stamp! I'd have so much fun using that stamp! I think I am in love! I've always been a Double Dots fan, always looking for more colors, and the wood accents are wonderful! Stamps stamps stamps!!! And I love the Jade double dot paper colour. Love the craft stuff and the stamps. Oh..........I feel a shopping spree coming on!~! I love the new stamps and embellishments! Great new products we have seen the last few days. I'm diggin it! Love the versatility of all of these goodies! I am loving al off this stuff!! The double dot colors are so pretty!! Those stamps are awesome!! OMG... I'm in LOVE ...Burlap lace, cute Kraft bags... Vintage Double Dot too...OMG< OMG !!! Love all of it amd want it all. I love it all! 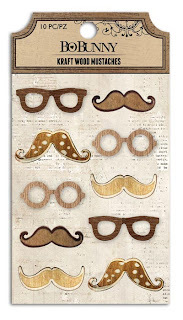 (especially the wooden glasses and staches!) Awesome! Wow, another great new collection! I love the vintage look. I want, want, want, no need, need, need the stamps. 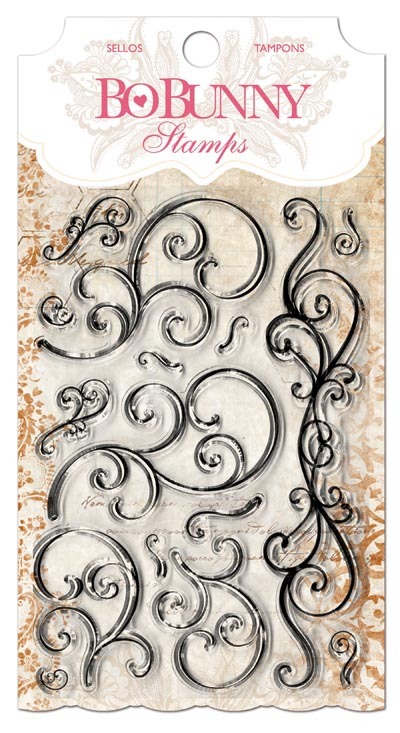 Love the flourishes. And love the wooden embellishments. Wow. I just...I love...I'm speechless. It all looks so fun! Love all the new products BoBunny. Hard to pick a favorite. They are all so unique and special. Want them all. LOL. 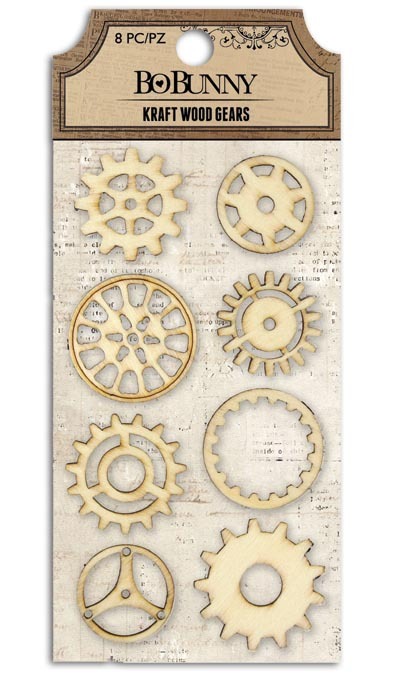 LOVE the wood gears and mustaches/glasses! Perfect for my male dominated household! And the double dots...LOVE this too! Must get a keyboard cover...I think I just drooled on it! Love the new double dot and the wooden embellies!! Oh boy! Not only kraft but double dot? Too much temptation! 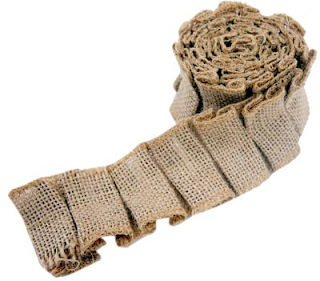 that burlap lace and roll paper. I love the new card stock!! great colours! I am so excited to get my hads on this wonderful! new stuff! I LOVE this!!!! Love it all! The new double dot colors are beautiful. Can't wait for all of this to hit the shelves. Thud!! That's my jaw hitting the floor!!! I loveeeeeee it all!! BESTEST FAVORITEST STAMPS ever!!! I need me lots of those gorgeous Kraft bags too!!!! Wiping the drool from the keyboard!!! LOVE!~!! I love the new colours and the wood embellies....wow! Oh man, all of my favorite in one post! Kraft paper, dots, stamps...yum yum! Wow! It's all so wonderful! Love using kraft in my projects, and the burlap...love it!! I love the whole collection. How can you pick one to be a favorite. Thanks for the chance to win. Love all of these!! Bo Bunny is truly my favorite company!! Love all of these embellishments! Bo Bunny has done it again with great products. Those stamps aRe brilliant. And the new double dot vintage aRe a dream. Those gift bags? Genius! Ans the paper rolls- a real innovation. Bo bunny never disappoints!!! O my goodness I am in Looooove! I adore the bags and paper tapes. 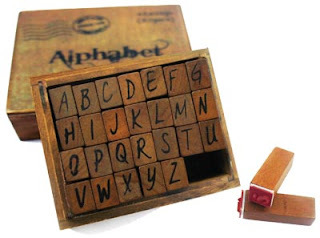 The wooden stamps are darling (I love how rustic the packaging is!). 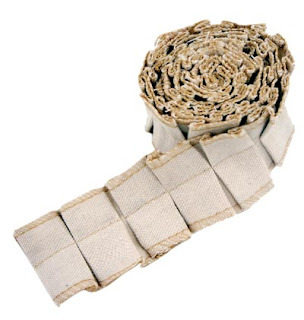 The burlap ribbon - I can't get enough. Please let me win. 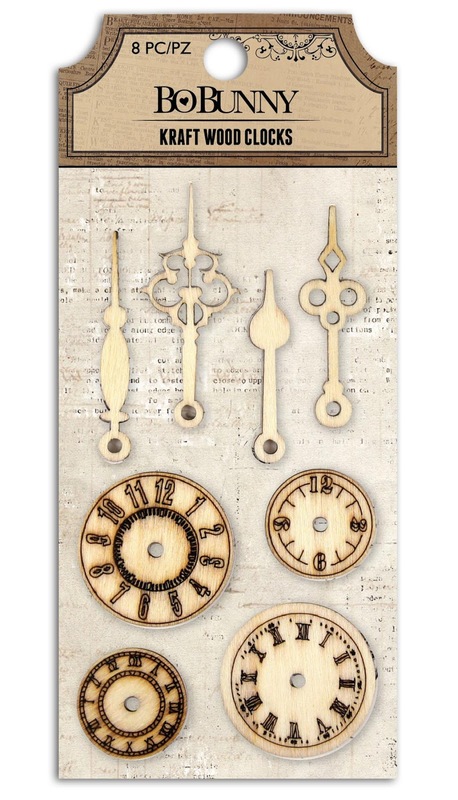 I'm in love with those awesome wooden clocks! Kraft! Oh how I love Kraft! I love ALL of these! The dotted papers and the kraft are my favorites and oh my goodness, I love the stamps! Love the craft bags! Where can I buy them? I know I will use it all-this is just my style.There are so many things you can do with it-versatility is always important to me.My favorites are the bags and the alpha stamps-I've been looking for just the right vintage type stamps for a long time.Yu nailed it with these. I'm LOVING all these fun new products! I so want these like yesterday!!! Love it all!!! Bo Bunny ROCKS!!!!! Wow!! I love everything! The new double dot colors, the stamps, the envelopes, the wood pieces. Awesome new products! LOVE, LOVE, LOVE this line!! So cool! This is my favo... Just can not waith when the are in the shop. I really love the stamp sets, they are different and fun! I so have double dot addiction. Love the versatility of the stamps too! Love love love, no need need need those stamps. And love the wooden embellishments. Thanks for the chance to win. Love the pleated canvas and burlap, and those colors are great! The number stamps will be a necessity! Wow! Fabulous! I love all of these, especially the kraft. Love all the Kraft goodies. Can't wait to get some. I love these new embellishments and the dots are gorgeous!! Wow! Love these kraft goodies ! Beautiful ! I am in love with the stamps!! 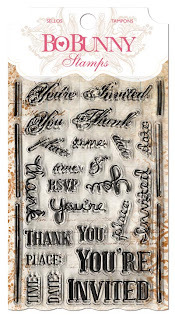 Especially the clear flourish stamps - they would be perfect for the wedding invites that I'm making!! Everything is gorgeous - love the black jazzy designs on kraft! Those double dot colours are just gor-ge-ous! Oh my goodness I am in love! Lisa L.
Wow! Love, love the Kraft pieces! They will be so much fun to many layouts. Great release!! omg, i thought the collection releases were over the moon, now the new embellishments are drop dead gorgeous, kudos to the designers !!! Oh my gosh ... LOVE. LOVE. LOVE.!!! 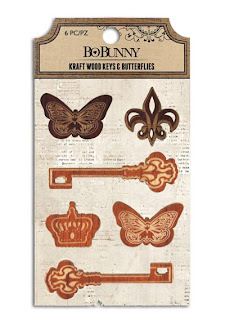 I am really into the wood embellishments these days - and BoBunny has amazing pieces! Besides those sweet little things, I also seriously want the Kraft gift bags and the large number stamps - simply amazing!!! WOW! Love the wood embellies and those awesome Kraft bags! They are all so fabulous!! Love the stamps!! Just saw this and it is FANTASTIC!!! LOVE the versatility!!! love that Shadow Vintage paper and the bags and the wrap!!! Love the decorative paper rolls and the paper colors are fantastic! I just love those moustaches!